The John Beswick Studios are most famous for their animal ceramic figurines, figurines based on cartoon characters, and for their range of Beatrix Potter figurines. 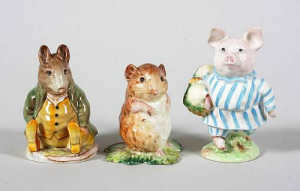 Pictured right: Collection of Beswick Beatrix Potter figures sold at Bonhams, Chester for £432, June 2008. Collectors have always been attracted to Beswick due to the fun nature of many of the figurines, and the quality of the sculptures. There has always been interest in the Beatrix Potter range and the TV and cartoon character tie-ins are increasing the awareness in Beswick figurines. The John Beswick Pottery was established in 1894 at Loughton, Stoke-on-Trent. The company started as J.W.Beswick founded by James Wright Beswick and his sons John and Gilbert. Initially producing tableware and ornaments, and only later in the 1930s turning to animal modelling notably for famous racehorses and champion dogs. James Wright Beswick died in 1921, but the company continued to expand under his grandson, John Ewart Beswick. In 1934 the introduction of high fired bone china meant they could produce high-quality figurines, such as famous race horses and champion dogs. The company became John Beswick Ltd, in 1936.
produced a range of whimsical figures of animals in with human expressions and in human poses. 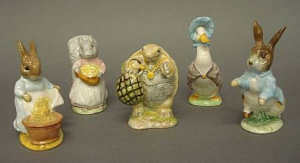 Pictured left: Three Beswick Beatrix Potter figures: ‘Timmy Willie’, (BP1), ‘Little Pig Robinson’, (1st variation), (BP1), and ‘Samuel Whiskers’, (BP1). (3) sold at Bonhams, Knowle for £264, June 2009. In 1948 the company began producing characters from the Beatrix Potter story books. This was a suggestiong from Lucy Beswick. It was John Beswick himself who first received the rights to reproduce the characters and 1997 marked the 50th year that Beswick and Royal Doulton have been producing Beatrix Potter figures. The initial range produced in 1948 consisted of 10 figures. The first piece created by chief modeller Arthur Gredington was Jemima Puddle-Duck, which was released along with 9 other characters, including the ever popular Peter Rabbit. The Beatrix Potter was re-intoduced in 1998 and production ran until 2002. These were an immediate success, and realising that animated characters could make excellent figures produced Zimmy the Lion (this was created by David Hand who worked on several Disney features such as Snow White and Bambi). In 1952 Beswick began its Disney range with Mickey Mouse, and later in 1968 produced a series of Winnie the Pooh figures. These figures are extremely sort after today. The Royal Doulton Group bought Beswick in 1969 and production ceased in 2002. The purpose of these pages is to provide information to collectors of Beswick figurines.